Mentors……come and go…. – CPA Theatricals, Inc. Sometimes you find mentors in the strangest places. Sometimes you pay them, and sometimes they become friends. Mentors are very important to me, and I listen to every word they say. I have had some great mentors in my life, but none as special as John Glines. John Glines was retired when I met him, but he was still very much interested in theatre. And, he was very much interested in helping me move forward. He desperately wanted my shows to succeed. He gave me some incredibly valuable pieces of advice and he told stories, of course. Here is one of my favorite stories of his. The moral of the story is that sometimes you already know the answer to tough questions, you just have to listen to your gut. But, perhaps the best advice John Glines gave me was when I was shaken by disagreements with my other collaborators. He looked me right in the eye and said something like “Don’t shy away from those challenges! It is the abrasion that creates the pearl!” WOW. 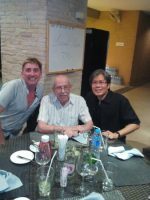 John passed away last week with his husband, Chaowarat Chiewvej, by his side. Playbill, Broadway World and several other theatre publications wrote beautiful biographies about this brave, talented and award winning Broadway producer. He was all of those things. But, in addition, he was my mentor and my friend. I will miss him very much.